Just six months after a sparkling 5-0 win over Wadebridge Town in the Final of the Charity Cup, Mousehole were eliminated from this season’s competition in an incident-packed first round tie by near neighbours Penzance. The result came as something of a shock to the form book as The Seagulls had been defeated only once in two months, whereas inconsistent Penzance had lost at lowly Bude Town in their last match despite holding leaders Liskeard Athletic to a draw the week before. It was certainly a day to forget for Mousehole as they were without several injured key members of the first team squad and created for themselves a major self-inflicted problem, as well as an uphill battle, with an unnecessary sending off just before half time. Penzance on the other hand will be jubilant after their biggest win over their fiercest rivals in living memory and can now look forward to the ‘local derby’ league encounter at home on Boxing Day with confidence high. The Magpies signalled their attacking intent from the outset, forcing their former keeper Dom Angove into a great save in the 4th minute as he stretched to claw out a goalbound lob. Back came Mousehole with Lorenzo Qerimi firing over from a one-on-one position on 14 minutes and driving past the angle from the edge of the box two minutes later. At the other end Penzance were unlucky with 20 minutes gone when a 20-yard shot was deflected just wide past a wrong-footed Angove, but they then survived two chances when Paulo Sousa missed the target from close range on 27 and player-manager Kevin Nicholson’s low drive skidded inches past the far post on 32. Centre back Ryan Andrew was withdrawn injured on 33 after a crunching tackle and a lengthy delay, but the first of several talking points came on 38 when referee Rowan Clarke awarded a penalty after he spotted an infringement as defenders and attackers all jostled for a floated cross from the right. After prolonged and indignant protests from the visitors, ex-Seagull Lewis Caspell drove the spot kick low into the corner to put the hosts in the lead. Another disputed decision, this time about a throw-in deep in Mousehole’s half, led to another Penzance goal in the second minute of added-on time, as a long cross from the touchline to the far post was expertly headed home in characteristic fashion by Mark Vercesi, another ex-Seagull. And as The Magpies celebrated, worse was to follow for Mousehole when Paulo Sousa’s comment about the officiating earned him a straight red card, thereby becoming the fourth Mousehole player to be sent off this season. The second half started with Penzance content to sit back while Mousehole’s ten men passed the ball around looking for an opening to get back into the game. But Kevin Nicholson went off injured in the 58th minute and five minutes later James Vercesi made it 3-0 with an easy close-range finish after brother Mark had opened up a depleted defence. On 68 minutes Gerens James got on the scoresheet for 3-1 with a penalty after substitute Craig Wilcox had been fouled in the box, but Mark Vercesi restored The Magpies’ three goal advantage on 75 when he won yet another header to nod against the post and was then first to the rebound. And James Vercesi had plenty of time and space to shoot home for 5-1 with ten minutes left as Penzance continued to do the simple things well. The game drew to a close with Mousehole restoring a semblance of pride with two goals in two minutes. Hamza Kaid scored his first for the club after chasing a loose ball on the left and cutting in past two defenders to score off the far post on 90, followed by Jake Andrew firing home a deflected shot from 15 yards on 90+2. 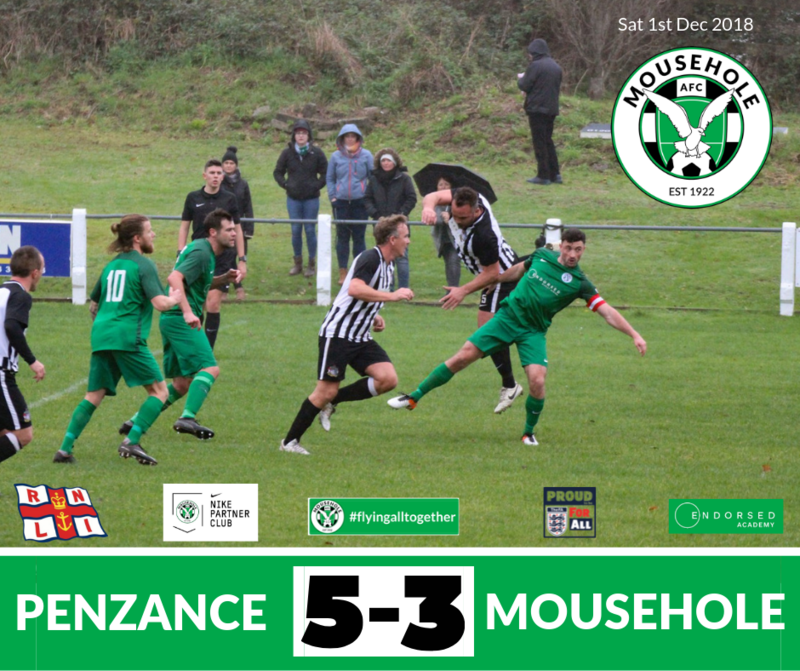 Penzance now move forward into the quarter finals of the Charity Cup on February 9th, whereas Mousehole also have a quarter-final tie to look forward to in the League Cup, with several third-round ties still to be played. 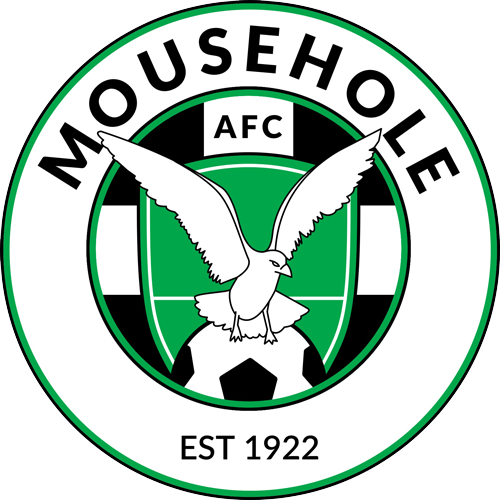 Mousehole’s away league fixture at Holsworthy this Saturday (8th) has been postponed – with a new date of April 13th – as the hosts are involved in a Devon Premier Cup tie against Elmore which was called off last Saturday. Penzance are at bottom club Ludgvan on Saturday (2:15pm). The Seagulls are next in action on Saturday 15th December with a home league game against Dobwalls at Trungle Parc, kick off 2:15pm. Mousehole v Penzance: Dom Angove, Tyler Tonkin, Billy Curtis (captain), Ryan Andrew, Kevin Nicholson, Luke Hunter, Steve Burt, Lorenzo Qerimi, Paulo Sousa, Gerens James, Hamza Kaid. Substitutes: Tom Hands (for Ryan Andrew, 33), Jake Andrew (for Lorenzo Qerimi, 46), Craig Wilcox (for Kevin Nicholson, 58), Jason Robertson, Sam Shulberg. Scorers: Mousehole – Gerens James (pen 68), Hamza Kaid (90), Jake Andrew (90+2). Penzance – Lewis Caspell (pen 38), Mark Vercesi (45+2, 75), James Vercesi (63, 80).